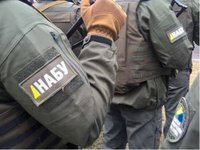 Detectives of the National Anti-Corruption Bureau of Ukraine (NABU) are raiding the head office of PrivatBank (Kyiv) in Dnipro, the NABU has reported. "NABU detectives under the procedural supervision of SAPO [Special Anti-Corruption Prosecutor's Office] prosecutors are raiding the head office of PrivatBank in Dnipro," NABU wrote on its Facebook page on Thursday. The bureau said that the office is raided as part of an investigation into a criminal case launched due to alleged abuse of office by officials of the National Bank of Ukraine (NBU) and embezzlement of PrivatBank's funds in the large amount committed by managers and owners of large stakes in the bank (Part 2 of Article 364 and Part 5 of Article 191 of the Criminal Code of Ukraine). The state faced loss of UAH 116.8 billion (the money injected into the bank for its capitalization). In turn, PrivatBank said in a press release that the raid by the NABU was scheduled several days in advance. "As part of the criminal case investigating into the unlawful issue of credits by former owners and top managers of PrivatBank the scheduled steps are made NABU jointly with the bank. Under a petition of the NBU divisions of the bank jointly with NABU detectives are thoroughly analyzing the documents," the bank said.